Jacob Krupnick's Girl Walk // All Day went viral before it was even finished. In early 2011, a short video featuring three people dancing around New York to songs by the laptop DJ Girl Talk quickly spread through social networking sites. Riding a wave of positive coverage, including a write-up in the New York Times Magazine, a Kickstarter for a projected feature based on the short raised over $24,000 (having had a goal of $4,800). It's not hard to see why the seven-minute teaser became so popular. Anne Marsen, Dai Omiya, and John Doyle tear through Manhattan, provoking amused expressions and averted gazes, matching Girl Talk's frenetic party music with equally mashed-up dance moves. Doyle presents an exaggerated take on popping and locking, becoming a kind of genre- and gender-bending B-boy; Omiya bases his routines on tap-dancing, mixing the traditional form with jerky, contemporary movements; the primary attraction, though, as every review notes, is probably Marsen, who seems to have internalized every form of both popular and traditional dance, to have all gestures and flourishes on call, and to move within and between modes seamlessly. The music of Girl Talk (aka Gregg Gillis) inevitably divides audiences. Gillis's general strategy is to take two songs and combine the catchiest elements, hold them together for a brief period, and then move on to another combination. What you get is pure, undifferentiated climax for the length of an album. To some, this creates a kind of problematic joy for which the only solution is to dance or turn the volume up very, very loud or both; for others, Gillis's strategy is cheap, and his appropriations deaf to the social meanings of his sources, violating the integrity of the artists being sampled—and the cultures from which they come—by blending everything together into one extended pop confection. Either way, though, Krupnick's Girl Walk // All Day is a work of art that transcends its inspiration: its combinations are more thrillingly inventive; its visceral populism more substantial. The movie begins with a seemingly silly parable for artistic revolt. Marsen is in ballet class, diligently following instructions. As the Girl Talk interrupts the classical piano in the background, Marsen's body begins, seemingly of its own accord, to resist the strictures of classical dance. Her limbs dislodge themselves from routine to shake and pulse mightily. She leaves class and journeys to the Staten Island Ferry, arriving, reborn, at the lower tip of Manhattan. Beginning at the Whitehall Terminal and ending at the top of Central Park, Girl Walk is structured as a tour through Manhattan. One of the most notable things about a lot of viral sensations is their cinematic atavism, and Girl Walk belongs, in a sense, to a very old movie genre: the city symphony. City symphonies were mainstays of the silent era; the most famous examples are probably Dziga Vertov's Man With a Movie Camera, Walter Ruttman's Berlin, Symphony of a Metropolis (after which the genre is named), and Charles Sheeler and Paul Strand's Manhatta. Like a lot of other silent film genres, the city symphony was abandoned by Hollywood in the '40s only to be taken up later in the century by avant-garde filmmakers; more recent examples include Jem Cohen's Lost Book Found and Nathaniel Dorsky's Variations. In the '20s and '30s, the city symphony was, among feature films, the most overtly political spectacle the movies had to offer. The structuring metaphor for city symphonies was often biological—the city as complex organism—and the goal was a kind of comprehensive taxonomy: to show how the different parts all fit together. This meant a reckoning with the diversity of modern cities, and almost inevitably it meant making visible issues of class identity, which were usually ignored or simplified into comedy by other Hollywood genres. Girl Walk sweeps through Manhattan looking for distinctive settings, gestures, wardrobes. As the performers chew the scenery, all movement is put on the level of dance: the collar-straightening of businessmen and the cheering of baseball fans alike. Marsen herself is a kind of trickster god moving through different cultural modes. Her dancing foregrounds our somatic awareness of identity, the way social forces are internalized physically and negotiated in public space. The freedom she claims in moving between identities makes an argument for their contingency; changelings make good arguments for the possibility of change. 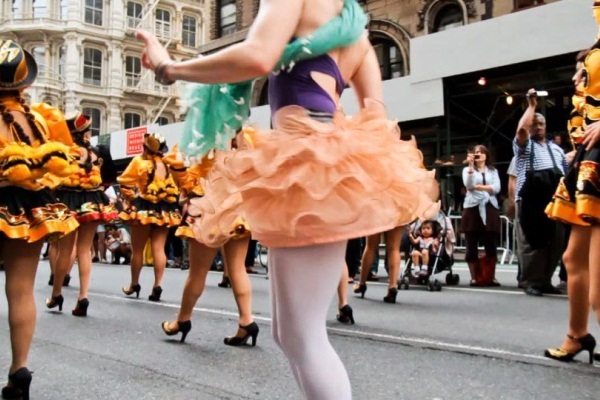 In its prankishness, Girl Walk belongs to a popular idiom that includes YouTube "flash mobs," MTV's Jackass, and Improv Everywhere. All intervene in daily life to disrupt the regular order of things. But the massive popularity of Girl Walk comes at a time when such gestures carry an extra crazy little electrical charge. Theater troupes like Improv Everywhere were presaged by the French Situationists, whose antics drew on theoretical writings by Henri Lefebvre and Situationist philosopher-king Guy Debord. Lefebvre and Debord focused on how quotidian life—the humdrum of streets and marketplaces—is tightly controlled by dominant political forces. Looked at this way, daily life becomes an adequate site for rebellion; the mere disruption of the normal arrangement of public space is a meaningful and potentially radical act. 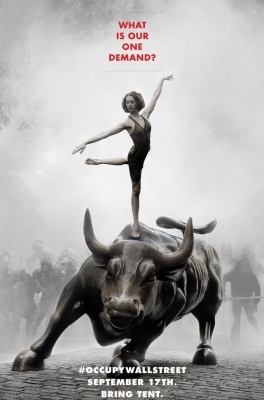 What should we make of the fact that, at one point in Girl Walk, Omiya tap-dances on top of the Wall Street bull, echoing AdBuster's initial Situationist-inspired poster for OWS? It certainly doesn't seem accidental that the film's final section is called "For the People," or that its most narratively inventive episode ends at Zuccotti Park itself during the heyday of the occupation. Marsen, alone, has a destabilizing presence. Most of the time, she plays an archetypal American innocent: ebullient, clueless, impressionable. She tends to follow traditional rules of clowning: don't speak; always say yes. She resembles one particular clown, and that's Charlie Chaplin's Tramp. The typical Chaplin routine, after all, placed the Tramp in a public setting rotten with pretension—a fancy restaurant or dinner party or unveiling ceremony—and let the vagrant wreak havoc with his body through ill-timing and poor posture. The Tramp is always both chameleon and pariah, and so his mimicry is double-edged; he makes society's prescribed roles seem silly both when he inhabits them effortlessly and when he fails to. Marsen's mimicry is of the same nature. The eighth chapter of Girl Walk begins with Marsen on an escalator, entering a department store. Immediately, she's enthralled by the elaborate displays. She's overwhelmed, in fact, having never encountered such sublimity before. The naïf lost in the shopping mall is a trope descended from Chaplin's Modern Times (and carried through in, among others, George Romero's Dawn of the Dead and, more recently, the original music video for Kanye West's "Heard 'Em Say"). The joke, each time, is that the dopey main character or characters can see in the store only the thrill of plentitude, whereas most of us can see also the unavailability of it all. Marsen plays with this, miming wonder at every expensive arrangement and tracing the shape of the commodities with her body, using each decoration as a pretense for new movement. She gets a free makeover and, after confronting her new visage in a mirror, her persona is transformed, as signaled by a new wardrobe. Marsen's Kabuki-impression of a wealthy fashionista burns with giddy contempt. She struts down the sidewalk, looking over rivals with an impressively appropriated male gaze, amassing unwieldy shopping bags. The performativity of gender roles has rarely been laid bare with more anarchic amusement. After a brief interlude, Marsen's shopper ends up at Occupy Wall Street, where she poses with her expensive loot for eager journos and is jeered by the protesters. After this, Marsen bumps into a dour child while checking out her reflection. In an attempt to cheer the child, she offers all manner of designer tchotchkes, but to no avail. 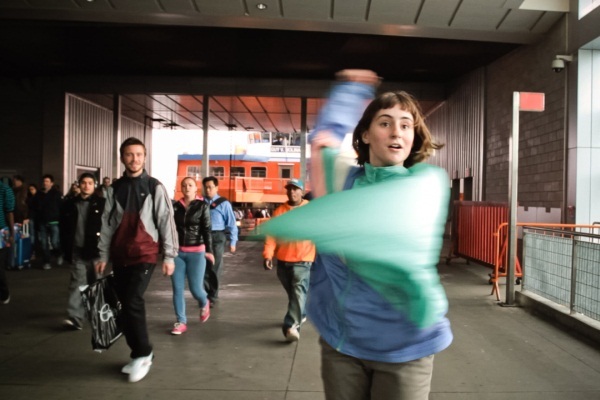 It's only when Marsen begins to imitate the child's annoyed shrugs—the contagion of bodily movement could be the unifying theme of Girl Walk—that the kid begins to cheer up, and Marsen begins to shed her baggage, which has become an albatross. Another wardrobe change and Marsen and the child cheer each other and shake wildly. The movie's opening parable of revolt is reiterated: the body is liberated from a prison-house of predetermined form and begins to move with improvisatory delight. The redeeming innocence of the child once again recalls Chaplin; the Tramp tends to escape the corrupt, adult world by befriending a youth, an invalid, or an animal. The conceit is itself innocent; on one level, Girl Walk is a charmingly innocent movie. The movie is a literalization of a previous generation's innocent, utopian anthem of collective joy: "Dancing in the Street." But Girl Walk has struck a nerve—the artists have so far received 1,943 screening requests—because underneath its innocence is a rage for disruption: of order, of space, of identity. At Occupy marches, various people will often yell: Vote with your body! The phrase is meant as a profound rejection of representational politics, which functions through proxies; but it's also an effective exhortation because, as Girl Walk illustrates, it sounds like fun.